Formulation: Liquid. In 10mM TRIS, pH 7.5, containing 150mM sodium chloride, 1mM EDTA, and 1mM DTT. Scientific Background: Mouse Hsp60 belongs to a highly conserved family that includes molecular chaperones from a variety of species such as plant Hsp60 (known as Rubisco binding protein), GroEL, the E.coli Hsp60, and the 65kDa major antigen of mycobacteria. Hsp60 is localized in the mitochondrial matrix of eukaryotes, and in the chloroplast of plants. Hsp60s from divergent species share a number of common characteristics: high abundance; induction with environmental stress such as heat shock; homo-oligomeric structures of either 7 or 14 subunits which reversibly dissociate in the presence of Mg2+ and ATP; ATPase activity; and a role in folding and assembly of oligomeric protein structures. These similarities correspond with studies in which the single-ring human mitochondrial homolog Hsp60 and its co-chaperonin Hsp10 were expressed in an E. coli strain engineered to keep the groE operon under strict regulatory control. The findings demonstrate that expression of Hsp60-Hsp10 enabled successful performance of all essential in vivo functions of GroEL and its cochaperonin, GroES. Several studies reveal a possible link between members of the Hsp60 family and a number of autoimmune diseases, atherosclerosis, and chlamydial disease. Overexpression of self Hsp60 is seen in the synovial tissue of rheumatoid arthritic (RA) patients, and can accompany both cellular and humoral reactivity against Hsp60 in RA . 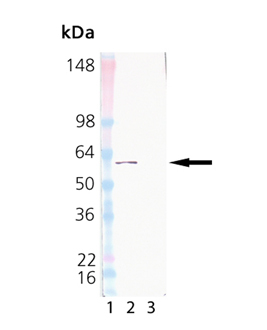 Chlamydial heat shock protein Hsp60, a homolog of E. coli GroEL, appears capable of eliciting macrophage activation, and several studies reveal a correlation between Hsp60 responses and the immunopathologic manifestations of human chlamydial disease. 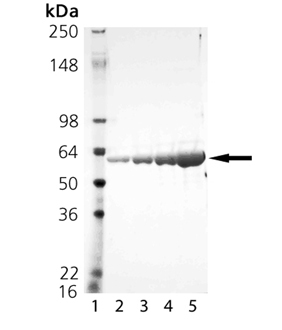 Western Blot analysis: Lane 1: MWM, Lane 2: Hsp60 (Prod. No. ADI-ESP-741), Lane 3: GroEL (Prod. No. ADI-SPP-610) probed with anti-GroEL mAb (Prod. No. ADI-SPS-870). Western Blot analysis: Lane 1: MWM, Lane 2: HSP60 (Prod. No. ADI-ESP-741), Lane 3: GroEL (Prod. No. 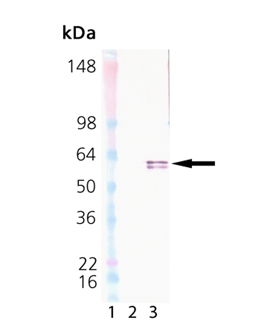 ADI-SPP-610) probed with anti-HSP60 mAb (Prod. No. ADI-SPA-806). SDS-PAGE analysis: Lane 1: MW marker, Lane 2: 0.5µg, Lane 3 : 1µg, Lane 4 : 2µg, Lane 5 : 5µg HSP60 (Prod. No. ADI-ESP-741).